social networks in which every individual has links to other individuals through the Internet. 1. Question: In your book [Smart Mobs], you say that mobile communications and pervasive computing technologies are changing the way people interact, including the ability to coordinate their actions with others around the world. Is this the essence of what you describe as “smart mobs”? Howard Rheingold: If you define “smart mob” as the use of Internet and/or mobile telephones to organize collective action in the social, cultural, economic, and/or political spheres. I think we are already seeing political demonstrations in the Philippines, Korea, Spain, and China; the emergence of Wikipedia and open source software; emergent collective citizen response to disaster; citizen journalism. These are a number of powerful early indicators that smart mobs are emerging around the world in a number of different spheres. The “digital divide” is still important. Without access to technology, these forms of collective action are not possible. However, the billions of mobile telephones in the world and the dropping costs of personal computers are narrowing the hardware divide. Increasingly important is the knowledge divide between those who know how to use their telephones and have Internet access allowing them to organize and join collective action, and those who do not. 2. Question: Is it an irony that mobile communications and pervasive computing are linked to people’s perception that they have less available time? Howard Rheingold: Every morning, hundreds of millions of people drive in their single passenger automobiles, often while talking on their mobile phones, to enormous cities, enter buildings of inhuman scale with tens of thousands of others, then sit in cubicles and communicate through computer screens. This certainly seems alienating. But is it the screens, the buildings, the cities, the phones, or the automobiles that enables the alienation? We have embraced technologies because they grant us individual freedom and power. The collective and individual cost of this embrace only becomes evident later. If you read Marshall Sahlins’ book Stone Age Economics, you will see that a case can be made that pre-agricultural hunters and gatherers had more time for what we still consider to be the good things in life — family, art, religion. You were out of luck if you got a toothache or appendicitis or grew too old to keep up with the tribe, but perhaps the tradeoff was worth it. 3. Question: You state in your book that understanding the hacker ethic and the way the Internet was built to function as a commons partially explains the explosive growth of the Internet and devices that are linked to the Web. What have you observed? Howard Rheingold: The technologies are enablers, not causes. The dynamics of human collective action — the eternal tradeoff between self-interest and collective good — are where the action is. Technologies that make altruism easy result in the collective emergent response to disaster, the creation of public goods like Wikipedia and open source software. But the attempts by entertainment and communication companies to “re-centralize” the Internet by violating network neutrality and installing hardware and software restrictions on how people can use the Internet signals a battle for control over these enablers. Collective action is only possible because the architecture of the Internet decentralizes innovation. But will this always be true? 4. Question: While referring to different types of networks you say that when a network aims at broadcasting something of value to individuals, such as a television network, the value of the services is linear; when the network enables transactions between individuals the value is squared; but when the same network includes ways for the individuals to form groups, the value is exponential. Could you please explain this concept? Howard Rheingold: Robert Metcalfe’s law states that the value of a telecommunications network is proportional to the square of the number of users of the system. This explains many of the network effects of communication technologies and networks such as the Internet, social networking, and the World Wide Web. The Metcalfe law can be illustrated by reference to facsimile machines: a single facsimile machine is useless, but the value of every facsimile machine increases with the total number of machines in the network, because the total number of people with whom each user may send and receive documents increases. 5. Question: Should we be concerned about the threat to citizens’ liberty, privacy or dignity given the direction and pervasiveness of technology? Howard Rheingold: Of course. This is why the last chapter of Smart Mobs has the title: “Always — On Panopticon…or Cooperation Amplifier?” . 6. Question: After all your studies of many cultures and of technology, are you optimistic about the future? In [Smart Mobs] Howard Rheingold observes that people are capable of cooperating and coordinating action in ways never before possible because they carry devices that possess both communication and computing capabilities. As we well know and appreciate, computers and electronic components are among the rare technologies that simultaneously grow more powerful and less expensive. Interestingly, in 1965 Gordon Moore, cofounder of Intel, observed that the number of transistors that can be placed on an integrated circuit increases exponentially, doubling every eighteen to twenty four months. And this Moore’s Law, which has been extant for the past half century and is expected to continue into the foreseeable future, applies to processing speed, memory capacity and almost every other aspect of digital electronic devices — even to the resolution of digital cameras. Technology can have positive results but there is also a risk of the opposite. Rheingold reminds us of George Orwell’s 1984, published in 1949, which portrayed surveillance technology as a tool of repressive social control albeit by a totalitarian regime. Fortunately that forecast has not been realized — or has it? Powerful microprocessors are being placed in ever increasing numbers and types of devices. When these consumer goods are linked to the Internet they can be used for positive purposes (such as avoiding traffic accidents or automatically calling for emergency services), or they can provide massive amounts of data about individuals that can be used by third parties for good, for evil or for control. Howard Rheingold observes that the personal computer and the Internet had their origins with hackers in the 1960s. These were not people trying to test security systems or just being obnoxious. They were early creators of computer systems, and they adhered to the view that access to computers should be unlimited, all information should be free, and there should be no centralizated control. The hackers designed the Internet to be an “innovation commons” — it was a community of hackers who designed it and the aim was to support similar communities. This is also the thinking behind open source software. 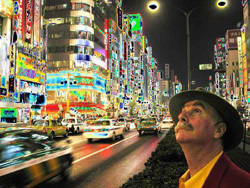 Howard Rheingold’s charm is his creativity and enthusiasm. Reading his [website] is an exploration that cannot be completed in a short period of time. It contains so many web links that you will become immersed in thought and study, and time will fly by. For example, you can read the full text of his books Tools for Thought (1984) and The Virtual Community (1993) online. He includes in his website interesting and often flamboyant artistic designs. At the bottom of his website Howard Rheingold states “You can see my [painted shoes], if you’d like.” My artist wife, Anne, thinks they are worth a look. Perhaps we should all paint our shoes. We should be concerned with the recent predictions in Nemertes Research Group Inc.’s report titled “The Internet Singularity, Delayed: Why Limits in Internet Capacity Will Stifle Innovation on the Web”. The findings were significant enough to have been covered by the BBC in a newscast on November 20th, 2007. The study concluded that Internet access infrastructure in North America will likely be inadequate to support demand sometime between 2010 and 2012. The researchers feel that core fiber, switching and router resources will increase to support user demand, but the $137 billion investment that would be required to upgrade broadband networks is 60 to 70 percent more than Internet service providers indicated they plan to invest. It is expected the Internet will not collapse but speed will be impacted. To say the obvious, the demand for bandwidth-intensive applications continues to grow at an accelerating pace. Any deterioration in speed, and the name of a sailboat I have raced against seems applicable -- “LordAlpus”.